Want to reduce stress? Learn to relax? Get an aquarium! Fish-keeping is cheaper than hypnotherapy or psychotherapy. Best of all, the therapists(fish) don’t talk back. They soothe your frazzled nerves with their delicate beauty, as they peacefully swim back and forth, back and forth, in their own little world. So, how do you create that little world for you and your fish? All you need is a tank, some gravel, a good filtration system, plants, heater, light canopy, and an aquarium stand. Then, stick to a regular maintenance and feeding schedule, and give your fish a lot of TLC. Beware of those “super-deals” — that $29.95 for a complete 10-gallon aquarium set-up is not as good as it sounds. You’re better off shopping for the aquarium components on your own. It’s a little more expensive but worth the additional cost in the long run. The tank: For a beginner, a 20 gallon tank is a good place to start, and don’t buy anything smaller than 10 gallons. When purchasing the tank, be sure to inspect it for cracks, scratches, and bad seals. Filtration systems: My biggest gripe about the $29.95 aquarium super-deals is the filtration system. These set-ups use cheap noisy air pumps to drive a submersed filter. I personally prefer power filters. These filters hang outside the tank. Water is drawn up an intake tube by a motor, and run through a sponge that catches debris before being released back into the tank — this is called mechanical filtration. The sponge also serves another useful function. It’s the home of bacteria that breaks down fish waste into less harmful components, a process called biological filtration. Heater: If you decide to keep tropical fish, get a heater. There are two varieties of heaters: one kind sticks into the water from an attachment at the top of the tank. The other type is completely submersible and attaches to the tank wall with suction cups. Both are equally effective. Gravel: I recommend buying gravel made specifically for freshwater aquariums. It doesn’t cost much, and you’re spared the hassle of worrying about other problems, such as contaminants. But rocks are rocks, you say. For freshwater aquariums, you want to stay away from soluble rock such as limestone because it hardens the water and makes it more alkaline. Some species of fish — like tetras — don’t like that. This is a 30 gallon heavily-planted tank. Most of the plants in here require a lot of light, so I use 3 fluorescent bulbs that are each 30 watts. I also use an iron-rich fertilizer that’s made specifically for aquatic plants. 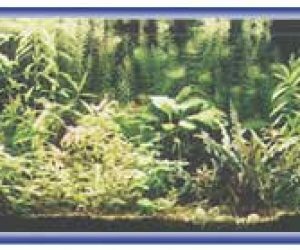 Plants and Decorations: It’s important to provide some type of cover for your fish, a place to hide if they don’t feel like socializing, or to get away from another obnoxious fish. Plastic plants and driftwood serve this purpose well. And if you have kids, those cool castles and sunken pirate ships are great fun, too. Canopy and lighting: There are two ways to go here. You can buy a plastic tank cover that has a built-in light strip. Or you can get an all-glass canopy and buy a light strip separately. But one important thing to keep in mind — don’t buy incandescent lighting. It puts out too much heat. Stick to fluorescent lighting because it produces less heat, and also provides more uniform illumination for your tank. Aquarium stand: Most aquarium stores have a nice selection of stands to choose from. An alternative to stands is a sturdy table. (I’ve found my office desk to be a great place for an aquarium!) One more thing: it’s important to place your aquarium in a location that does not receive direct sunlight — this encourages algae growth. Also keep aquariums away from air conditioners and heaters to avoid big temperature fluctuations that could stress the fish. Make sure the floor under your tank is level. If it isn’t, insert small pieces of wood or cardboard under the stand legs until the water in the tank appears level.